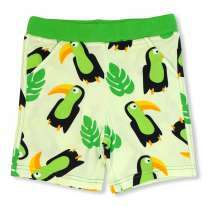 These JNY Aloha Tucan Baby Pants are with with a tropical tucan design, and green stretchy ankle cuffs and a fold-over waistband. Turn them up for your little one's first wear and unroll them as your child grows, extending the length of time these organic baby trousers fit for. 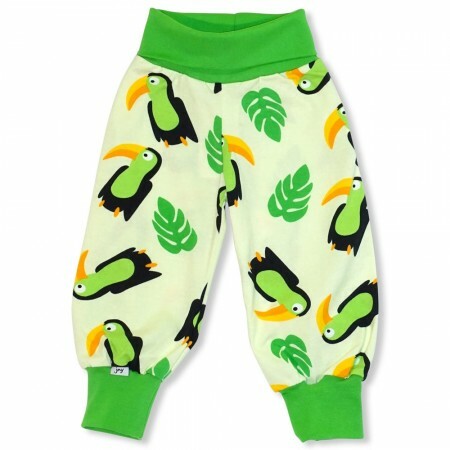 Whether your tot is wriggling, crawling, toddling or running, these JNY pants are great on little legs. Team up with matching items from the range for an organic cotton outfit or an ethical new baby gift. Ethically made in Europe with 95% GOTS organic cotton and 5% lycra. 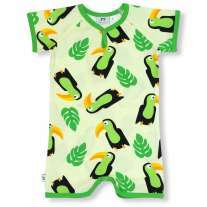 JNY's organic cotton baby clothes are kind on sensitive skin, eczema-friendly and eco too. 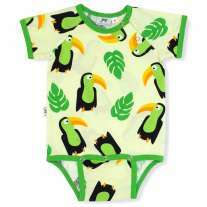 Green parents will love the top ethics as well as bright colours and fun Scandi prints - a top combination that's a little bit different to what you will find on the high street. Kind to skin, tough on adventures, fun to wear and environmentally-friendly – JNY cares about what kids love and what the planet needs. Their top priority is creating sustainable organic children’s clothing that mean you make the best choice for your children and the planet. JNY clothes are durable, focusing on top quality in design, materials and finish. Every single piece of clothing is made with GOTs certified organic cotton and manufactured in small family-owned factories in Europe.